If you were paying attention a couple of weeks ago you may recall my misadventures with mirrors. The crack’d one in its new frame was upsetting me. All that work, and ruined. We thought about solutions, mine was a bit nuclear. 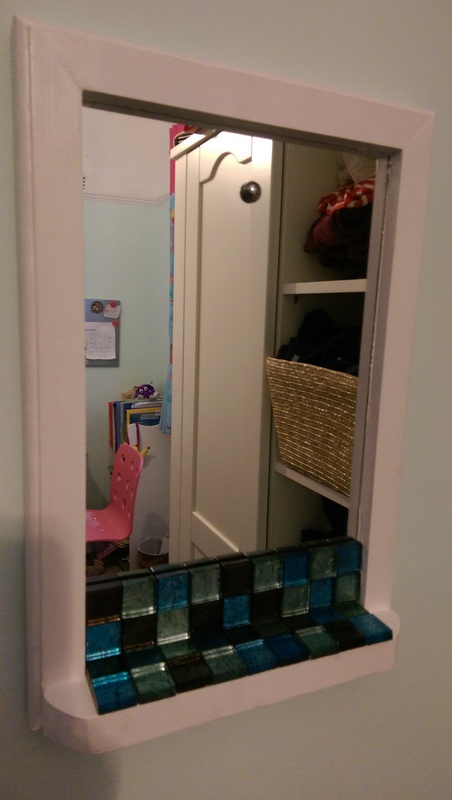 Cut the frame, trim the mirror with a tile cutter (what could possibly go wrong with that?). TBH came up with something significantly easier, more attractive and less likely to end in disaster. It’s not quite Clicky Chick quality, but I think it’s pretty neat. The technically minded will be wondering what happened to the fixing that should now be buried. I took it out and replaced it with a nail to stop the whole thing rocking and bear a little of the weight. The glass squares are from the tile shop. The come in a 30×30 single sheet, but we picked up one with a few missing because we did not need them all. They come pre-spaced on a net, but the gap here was a bit awkward and by luck nine of them just fit in the gap, so there was no grouting required. They are stuck on with double sided tape. Job done, and now I don’t have to worry about my mother’s superstition that you should not look at yourself in a cracked mirror.